I was supposed to be visiting my mom right now but her new kitten has ringworm so we decided it was best for me to just stay home. I didn’t want to catch it and then give it to my husband and/or our kitties! I’m super bummed since I don’t get to see her that often. She’ll be coming to visit in about a month for Christmas though so at least I will still get to see her soon! As far as ovulation, today is CD 19 and I got another negative test. My husband is still convinced that I am pregnant because he said he can just “feel it”. I think just last month during the time when I missed my period for two months he said the same thing though. As much as I am hoping he is right, I just really don’t think I am. Only time will tell. So today is just like the last few days…which means I am not ovulating. I have tested for the past seven days and none of my test strips ever came up positive. I am just going to keep testing and hopefully I will ovulate soon! If I still don’t ovulate over the next couple of months then I will probably see my doctor just to make sure everything is all clear. I may be going to visit my mom for the next few days so if I am not posting updates, I apologize! She doesn’t have internet and since I have Sprint as my cell phone provider I am not sure if I will have good enough service to post from my phone. Once I get back I will definitely start posting again though. Well I’ll get straight to it…I wasn’t ovulating yesterday and am still not ovulating today. I thought the test line was gradually getting darker and maybe I was going to have an LH surge but that still hasn’t happened. 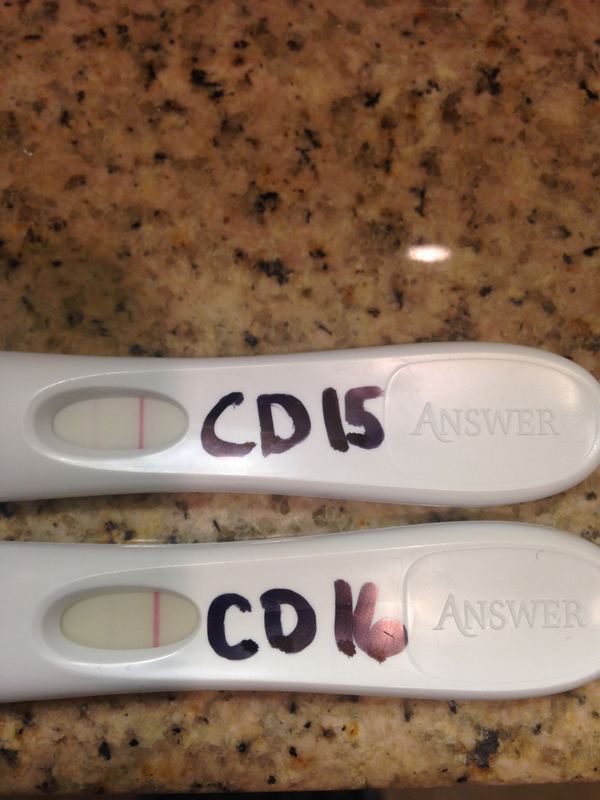 Today’s test line was pretty much nonexistent just like CD 11. I have been trying to test around the same time each day but would just an hour difference affect my results? Also, another blogger pointed out that your LH is lower in the early morning so maybe I am just testing too early or even drinking too much water on some days. I may also start charting my BBT just so I can see if I get a more accurate idea of when I am ovulating. I am still just trying to go with the flow and my husband and I have still been BDing even though I don’t seem to be ovulating. On a different note, yet another friend just announced she is pregnant with her second child. Usually I feel jealous and wonder why so many people around me keep getting pregnant while I just sit here waiting. I am actually thrilled for her though! It took her a very long time and a couple of miscarriages before she was blessed with her first child. It gives me hope because I know how much she longed to be a mother and now she is going to have another baby. I know it may take a while and I may hate that it takes longer than I want…and that’s okay. One day, years from now, I may be announcing that I am having a second child and this desire to have a child will be just a memory. At least, that’s what I am hoping. 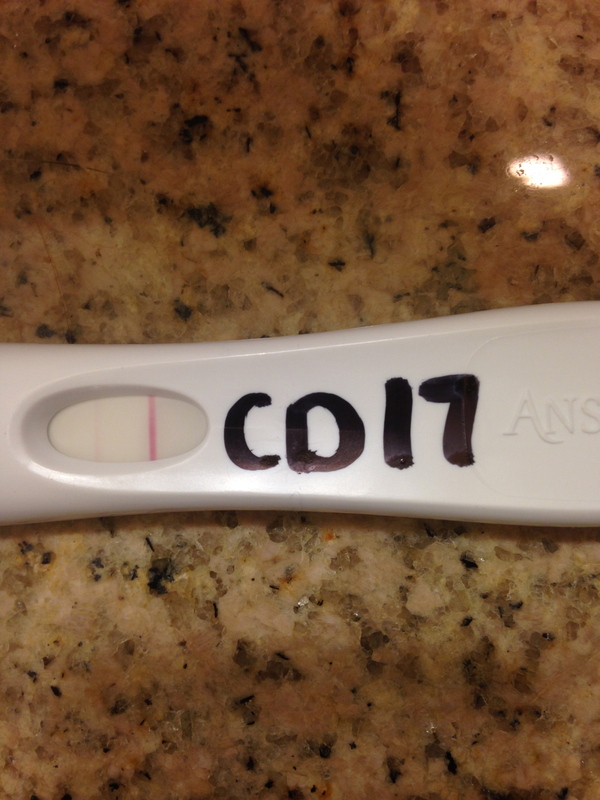 Well today is CD 14 and I don’t have much to share since I’m still not ovulating. I thought the test lines were getting darker each day but after today I am thinking that’s not the case. My test line today looked pretty darn similar to yesterday’s. 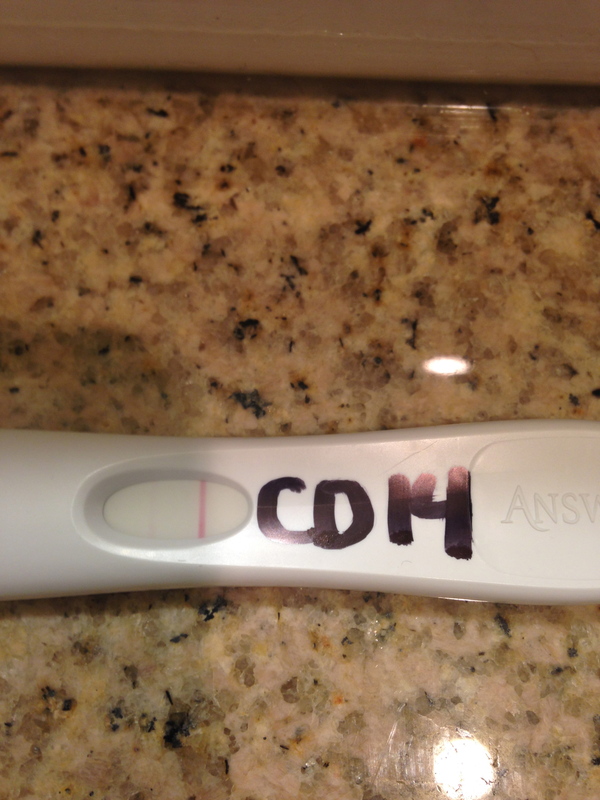 You just gotta love confusing ovulation test strips! 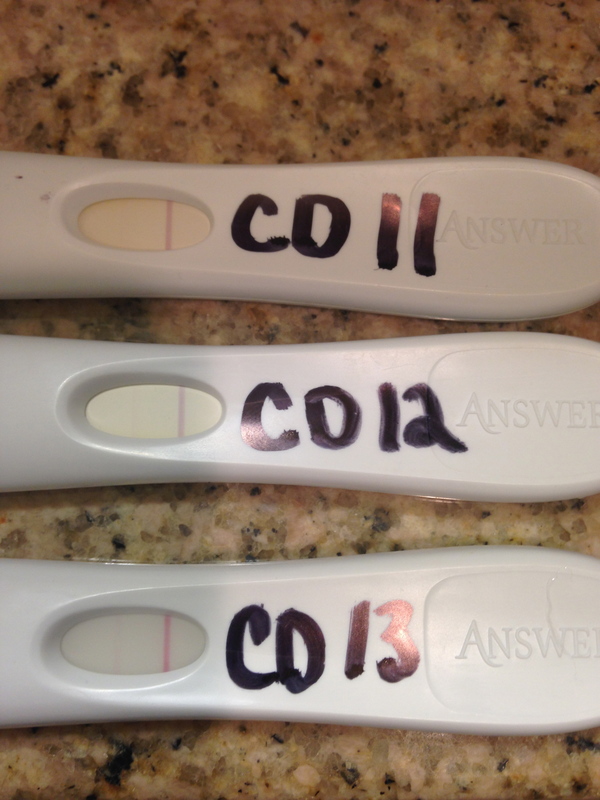 Well today is CD 13 and I am still not ovulating, but I am hopeful that I will be soon! Since CD 11 my test line has gotten darker each day and I am assuming that’s a good thing. 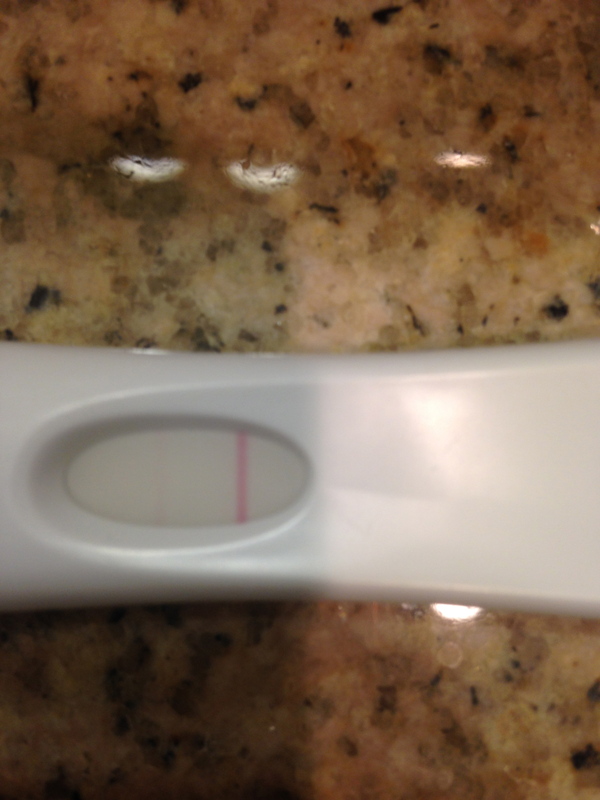 Even though it’s probably just a coincidence…for some reason I feel like I might actually ovulate this month. I feel like a lot of women who are trying to conceive can get down in the dumps if it takes longer than a month or so to get pregnant. I will admit, I am one of those women! It hasn’t even been a full four months that we have been trying and yet I am still so impatient. There are people out there and even in my life that it took a year, two years, or longer to get pregnant. Then there are the people who will never get to experience the joy of pregnancy at all. I don’t know my ‘fertility fate’ yet so until I have been trying for a year then I am no longer going to be so pessimistic about it. It can definitely be annoying hearing “just relax and it will happen” but I think it is a pretty valid statement. Unless you are struggling with infertility, of course. One of my friends was trying for months and then once they took a TTC break then a few weeks later she found out she was pregnant. I am not quite ready to take a break yet though since I feel like my body is still just taking some time to get back on track. Test line gradually getting darker! The line is very faint but here’s a close up! Well today was cycle day 11! I tested and sadly I am not ovulating. I am still going to test for the next 6 days and we’ll see if I ovulate at all or not. I don’t really have an accurate cycle length since I missed my period for two months and was just hoping it was a 28 day cycle. Maybe one of the tests will come up positive on one of the remaining six days but if not then I’ll just wait for my next period to get an exact number for my cycle length. Also, I just want to say thanks to my subscribers…all 4 of you! I know this can be a tough journey and it’s nice to have some ladies who I can relate to. I enjoy reading your posts and I wish you all luck on your journey from TTC to pregnancy! Okay, so this post has nothing to do with TTC but it does have something to do with being a mom. Well, a mom of two furbabies! Even though they are nothing like a real child I still feel like I’m getting some ‘practice’ in. They are both very needy, especially Angel. 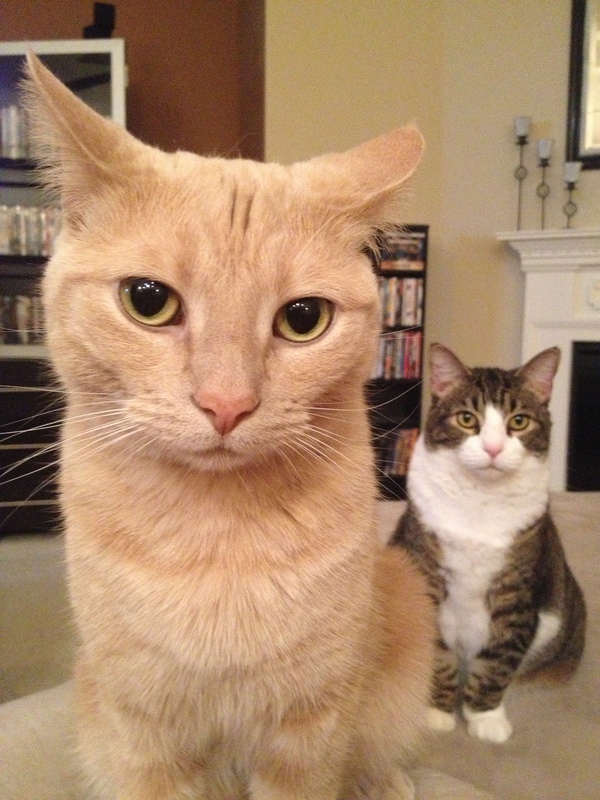 She always has to have my attention…well, when it suits her. I have had Mittens since I was 12 and my husband and I adopted Angel in August 2010. I have so much love for them so I can’t wait to feel the love I will have once I have a baby! Tomorrow is CD 11 so hopefully I will have some good news to share! !